"Men Bred in the Rough Bounds"
-- Duncan Ban Macintyre, 1725. Regiments bearing Scottish names, their ranks filled with men wearing the "bonnet, kilt, and feather" have played an important part in Canadian military history whether they fought as Scots in the British army with Wolfe, Amherst and Carleton in the 1750's through to the American Revolution, or as Scottish Canadians in defence of their own country. Disbanded Highland soldiery settled in Canada over two hundred years ago starting a military tradition founded on the strengths of their Scottish heritage: bravery, devotion, and fortitude in distress. Today, according to Stats Canada, there are over two million Canadians of Scottish descent. ...If Government pre-engage the Highlanders in the manner I propose, they will not only serve well against the enemy abroad, but will be hostages for the good behaviour of their relatives at home, and I am persuaded it will be absolutely impossible to raise a rebellion in the Highlands. Forbes' advice was only followed in part. Only one regiment was formed, and this by bringing together the scattered independent companies of the Watch to form the 43rd Regiment (it was later renumbered the 42nd in 1749). They fought bravely at Fontenoy on the continent and during the "Forty-Five" Rebellion, sagely foreseen by Forbes, remained in southern England awaiting further service overseas. A Black Watch private demonstrates "The Proper Position of a Soldier"
the French and Indian War and led it at the Battle of Ticonderoga, 1758. On the outbreak of the Seven Years War in 1755, William Pitt adopted Forbe's ideas with enthusiasm, leading to a policy which drained the Highlands of its best men to fight England's wars in Europe and North America. During this period no fewer than ten line regiments were raised, two of which, in addition to the Black Watch, served in North America. They were Montgomery's Highlanders (77th Foot) and Frasers' Highlanders (78th). All three regiments made their mark in the year 1758, but in three very different theatres of operations; The Black Watch in their heroic but futile storm assaults upon the abatis before Fort Ticonderoga; the Montgomery Highlanders forming the van of General Forbes' successful expedition that captured Fort Dusquesne (now Pittsburg); and the Fraser Highlanders taking part in the siege and capture of Louisbourg. Of the three however, the 78th could rightfully claim to have been the first Highland Regiment to have ever fought in Canada. They were not, however, the first Scots! at the sieges of Louisbourg 1758 and Quebec 1759. 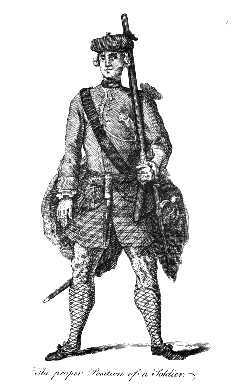 Many emigre Jacobites found positions as officers in the French army before, during and after Culloden and several were officers and soldiers in the Compagnies Franche de la Marine fighting Indians before the 77th and 78th were raised or the outbreak of the Seven Years War. In 1759, Frasers' Highlanders formed up on the right of James Wolfe's small army assembled on the Plains of Abraham and marched into Canadian history books. At the end of the war in 1763, the 77th and 78th were disbanded and every officer and man was offered a grant of land in Quebec according to his rank. Thus the disbanded soldiery of these two units became the nucleus of the first non-French settlers in Canada. And they were not the last. The Victors of Louisbourg and Quebec. 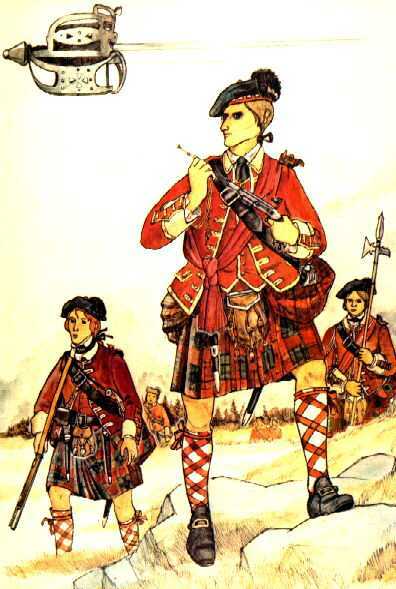 Fraser's Highlanders, 1757-63. (L to R) Private, Officer and Sergeant. 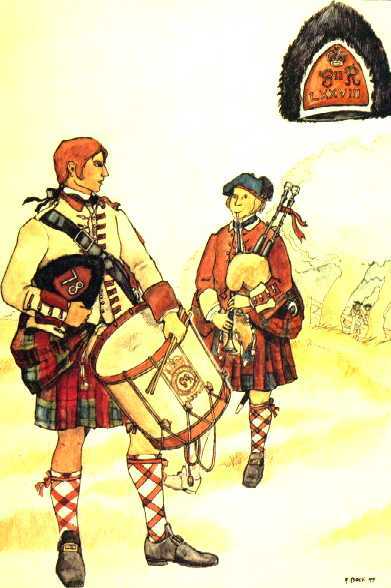 A Drummer and Piper of 78th Regt of Foot, Fraser's Highlanders, 1757-63. Between 1770 and 1815, some 150,000 Highland Scots came to Canada settling mainly in Nova Scotia, Prince Edward Island and Upper Canada. Most of them were displaced crofters from the western Highlands and islands of Scotland, victims of the infamous Highland Clearances. They were almost exclusively Gaelic-speaking and many were Roman Catholics. For a time, Gaelic was the third most-spoken language in Canada. When the first shots of the American Revolution rang out at Lexington in 1775, the British government once again turned to the Scots for help. More Scottish regiments were raised including one in Canada. On June 12, 1775, General Thomas Gage issued orders to Lieutenant-Colonel Allan Maclean to raise a regiment consisting of two battalions, each of ten companies, to be clothed, armed and accoutred like The Black Watch and "to be called The Royal Highland Emigrants". The idea was that the Emigrants ( the first Scottish regiment ever raised in Canada) would find recruits amongst former soldiers that had served in the 42nd, 77th, and 78th. As inducements to enlist, each man was promised further grants of land at the expiration of the hostilities and one guinea levy-money on joining. During the American invasion of Canada, the First Battalion Royal Emigrants under Maclean played a key part during the siege of Quebec 1775-76, repulsing General Montgomery's attack on the city in which the American commander was killed. Other Scotsmen were raised as a regiment to serve King George south of the border in New York state. A considerable number of Highlanders from Strathglass, Glen Urquhart and Glengarry had emigrated in 1773 to the Mohawk Valley and settled on the lands of Sir William Johnson, Superintendant of the Six Nations. His son was commissioned as a Colonel when forced to flee his lands and the Scottish tenantry that accompanied him were formed along with other loyalists into a provincial regiment under the name of The King's Royal Regiment of New York. The "Royal Yorkers", as they became known, saw action in 1776 when they defeated the Americans at Oriskany during the Saratoga campaign and participated on several notable raids into their old neighbourhood, the Mohawk Valley. Like the Royal Highland Emigrants, the "Royal Yorkers" were given land grants in what is now Glengarry and Stormont counties in Ontario. Their memory is perpetuated to this day by the Stormont, Dundas and Glengarry Highlanders, a Canadian militia regiment headquartered in Cornwall, Ontario. The Scots who fought in the War of 1812 were predominantly the Highlanders that lived on the banks of the St Lawrence from the Bay of Quinte right up to Trois Rivieres and beyond. 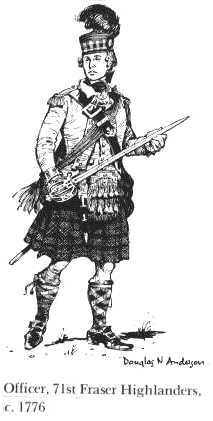 Though no Highlander unit in the strict sense of the word was raised, every militia unit along the river was very Scottish in character. 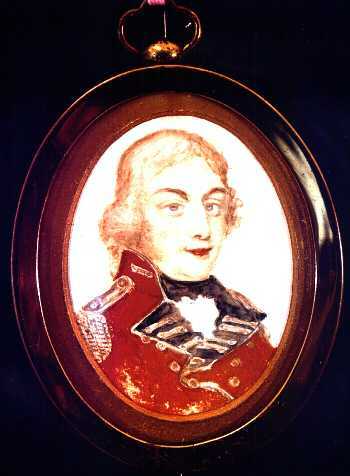 A quick glance at the names commanding the county militia regiments is revealing: Lt Col Alex MacMillan of the 1st Glengarry; Lt Col Allan Macdonnell of Greenfield of the 2nd Glengarry; Lt Col Thomas Fraser, 1st Dundas; Lt Col Allan MacLean, 1st Frontenac; Col John Ferguson, 1st Hastings: Lt Col Matthew Elliot, 1st Essex; Lt Col William Graham, 1st York; Col William Fraser, 1st Grenville; etc. Following the war of 1812, a number of Scottish line regiments saw tours of garrison duty in Canada including The Royal Scots, the 71st Highland Light Infantry, the 70th Cameron Highlanders, the 78th Rosshire Buffs (later Seaforth Highlanders, the 80th (Glasgow Lowland) and the 93rd Sutherland Highlanders. With the creation of the Dominion of Canada in 1867, the days of British garrisons were numbered, and with the exceptions of Esquimalt and the Halifax Citadel, the last of the regiments were withdrawn by 1871.
of the 1869 Imperial Garrison of Halifax at the Citadel. Uniform is that of the Rosshire Buffs (78th Seaforth Highlanders). After 1815, Scottish immigration to Canada increased in numbers and the pattern altered. Scots from Lowland areas joined Highlanders in coming to Canada. Some 170,000 Scots crossed the Atlantic between 1815 and 1870, roughly 14% of the total migration of this period. By 1850 however, most of the newcomers were settling in United Canada rather than the Maritimes. The 1871 census shows that 157 of every 1000 Canadians were of Scottish origin ranging from 4.1% in Quebec to 33.7% in Nova Scotia. It is no surprise then that when the British regiments left, volunteer militia units sprang up to fill the vacuum. The Black Watch (Royal Highland Regiment) of Canada rightfully claim to be the oldest Highland unit in Canada having been created in 1862 and are reflected as such in the army order of precedence. Bonnet, kilt and feather however, did not come until some later. Its Regimental history reveals that the unit started as a light infantry unit that evolved later into a "fusilier" unit from 1862 to 1879. Both early iterations of the regiment had flank companies dressed in tartan trews, but it was only on 10 May 1879, according to the Regimental historian that the Black Watch's ancestor, "The Royal Scots Fusileers", became "truly Highland Scottish in character" with "all ranks wearing Highland doublets and trews". Four years later, the unit had been completely outfitted with kilts and in 1884 were renamed "The Royal Scots of Canada". drill on the parade square inside Halifax's Citadel. part of a military uniform authentic to the period 1869. On the declaration of hostilities between Great Britain and Germany in August 1914, our Department of Militia and Defence, ignoring existing militia units and their traditions, enlisted men into a new series of numbered Canadian Expeditionary Force (CEF) battalions. Canadian historian George Stanley has stated that "...several of the CEF battalions were given Scottish designations...almost as if Sir Sam Hughes and Sir Edward Kemp had read the words of Duncan Forbes of Culloden or those of William Pitt." The first major battle of the Great War involving Canadian Scottish units was when French colonial troops broke and fled under a German gas attack at Ypres early in 1915. The 3rd Canadian Infantry Brigade, comprised of the 13th CEF Battalion (The Royal Highlanders of Canada, and today, The Black Watch), the 15th CEF ( 48th Highlanders of Canada) and the 16th CEF (The Canadian Scottish) was left dangling on the flank to receive the full brunt of the German attack which they successfully repulsed despite heavy casualties. It is impossible to tell the complete story of all the Canadian Scottish battalions in World War One therefore let the tale of one suffice as representative of the rest. The officers and men of The Black Watch of Canada fought in three battalions numbering some numbered 11,954 men and winning 26 battle honours. Of those who served, 2163 were killed, 6014 were wounded and 821 were decorated. Of the latter, Four were awarded the Victoria Cross out of the eight total awarded to Canadian Scottish units. The Canadian militia was reorganized after the war in 1919. No new regiments were raised, but many changed their names and were re-designated as Scottish units. For example, in this way, the 20th Regiment (1866) became the Lorne Rifles (Scottish) in 1931, then after a 1936 amalgamation with The Peel and Dufferin Regiment, The Lorne Scots as we know them today; the 21st became The Essex Scottish in 1927 (now the Essex and Kent Scottish); the 42nd became The Lanark & Renfrew Scottish in 1927 (now re-roled as an air defence artillery unit); the 43rd (1881) became the Ottawa Highlanders in 1922 and in 1933 changed to the Cameron Highlanders of Ottawa; the 50th (1913) and the 88th (1912) amalgamated to form the Canadian Scottish in 1920; the 59th became the Stormont, Dundas and Glengarry Highlanders in 1922; the 82nd became the PEI Highlanders in 1922; and, the 103rd became the Calgary Highlanders in 1924. The Mississauga Regiment formed in 1920 lasted a whole year before deciding to change its name to The Toronto Scottish in 1921. When the Second World War broke out, the peacetime militia regiments were mobilized intact, contrary to the government policy of the previous Great War. The first blooding of Canadian Scottish units occurred on the beaches of Dieppe, August 1942 when The Essex Scottish, the Cameron Highlanders of Canada, and elements of the Black Watch went ashore into a hail of fire with their comrades of Second Division. Out of the 5000 Canadians embarked, only 2210 returned to England and more than 600 of those were wounded: 900 had been killed and over 1900 had been taken prisoner, nearly 600 of them being wounded as well. When we read the battle honours of the Scottish regiments which formed part of the Canadian First Army, we read, in effect the battle honours of all overseas regiments - Moro River, Ortona, Liri Valley, Hitler Line, Gothic Line, Coriano Ridge,Caen, Borguebus Ridge, the Scheldt, Walcheren, Breskens Pocket, Hochwald, Zutphen, Kusten Canal, Apeldoorn. These and many other names are today part of Canada's military history, part of Canada's military tradition...0ne of which we can be proud. 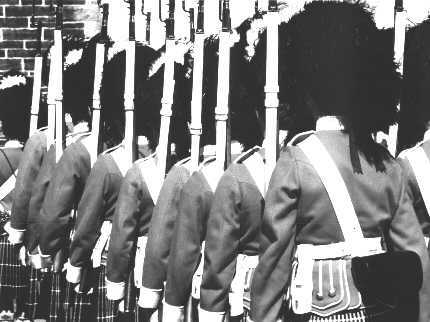 For a brief spell, The Black Watch were activated as a regular regiment with two battalions between 1953 and 1970. The battalions saw service in Korea, Germany with NATO forces, and on UN tours to Cyprus. 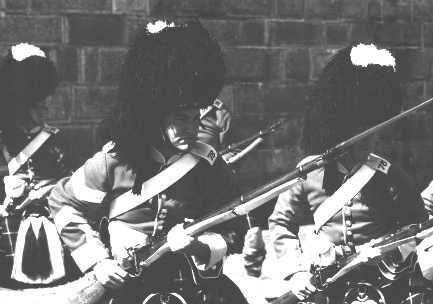 With the advent of Armed Forces unification and force reductions, the two regular force Black Watch battalions were reduced to nil strength and the Third Battalion (Militia) resumed its designation as Canada's senior Highland regiment. 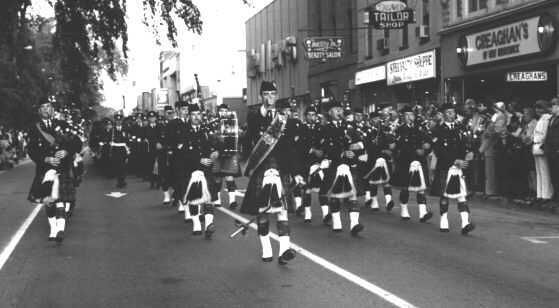 One consolation was that the uniforms, traditions, and instruments represented by the Black Watch's pipe bands were inherited gladly by the The Royal Canadian Regiment, Canada's oldest and most senior regular infantry regiment. stationed at CFB Gagetown, led a Freedom of the City of Fredericton parade. Regular Force army. They wear Maple Leaf (Canadian Government) tartan. The greatest misfortune that can happen to any people is to have no noble deeds and no heroic personalities to look back to: for as a wise Present is the seed of a fruitful Future, so a great Past is a seed of a hopeful Present. This article by Lt Col Ian Macpherson McCulloch first appeared in print in THE BEAVER: Exploring Canada's History, Volume 73/4 August/September 1993.